This salad dressing gives and gives this holiday season. It is a spectacular dressing, at home pooling between the leaves of icy cold cos as much as it is served with roast chook, roast veg or on leftover ham sandwiches. It makes over a cup, more than you need, but will keep in the fridge for a few days. 1. 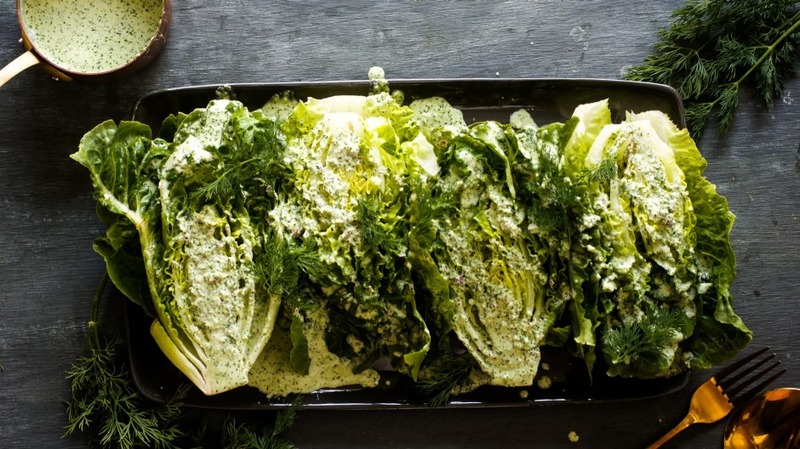 Arrange the cos lettuce halves, cut-side up, on a serving platter. 2. Add the dressing ingredients to a blender and blitz to combine. Ensure the onion has been blitzed and the mixture is free from large chunks – it should be quite thin. 3. Drizzle the dressing generously over the cos, scatter with a few extra dill fronds and serve immediately.